Paul was born in Hannibal, Missouri in 1948. His dad was a high school football and basketball coach. The family moved to Tucson in 1959. As a student at Palo Verde H.S., he became a four year state swimming champion and record holder in the 100 yd. backstroke while also being a member of the medley relay team which was also a four year state champion and record holder. Paul was also 2nd team All City in basketball and lettered in football his senior year. He was also selected as Palo Verde’s Senior Athlete of the Year. Upon Paul’s return from serving in the U.S. Army (Vietnam), he graduated from the University of Arizona in 1972 and proceeded to spend the next 36 years teaching and coaching in T.U.S.D. at Cholla High School. In addition he spent 15 summers coaching age group swimming teams at Sky Line Bel Aire, Rolling Hills, the Elks’ Club and San Rafael. He coached basketball as a volunteer assistant at C.D.O. Jr. H.S., St Ambrose, Salpointe H.S. and Palo Verde H.S. 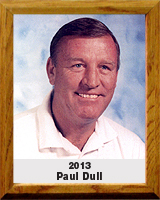 Paul’s coaching career at Cholla High School began as the boys’ and girls’ varsity swim coach for seven years. In 1979, he began his basketball coaching as the freshman boys coach. In 1983 he became the girls’ varsity basketball coach, amassing a 63-39 record over five years. He was rewarded by being named Division II Coach of the Year in 1987. In 1985 he was named the boys’ varsity basketball coach and accumulated a 185-135 record over 12 years. His 1991-92 team won the 4A state championship, the only state team championship Cholla has earned in any major sport.